The Fabulous Fox Theatre is pleased to offer seating and other accommodations for our guests with special needs. All special accommodations can be requested through MetroTix at (314) 534-1111 or (800) 293-5949, 9am to 9pm. Guests with hearing loss may also use the Relay Missouri service by calling (800) 735-2966 (TTY) or visit relaymissouri.com. The Fabulous Fox Theatre, in partnership with Lighthouse For The Blind, offers Audio Description services for those with some or complete loss of sight at the performances listed below. For more information about our audio descriptive services at the Fabulous Fox Theatre, contact MetroTix (314) 534-1111 or by email at [email protected]. For discounted tickets through Lighthouse For The Blind, contact Angie Yorke at (314) 423-4333. The Fabulous Fox Theatre offers performances interpreted for those with some or complete hearing loss by Lo's Communicate Plus LLC. Broadway productions will usually have interpretive services scheduled on a Friday of the show's run. For other performances or non-Broadway productions, please let us know your needs when purchasing tickets. A limited number of infrared assistive hearing head sets for those with some hearing loss are available at no charge for all performances at Guest Services in the main lobby. The Fabulous Fox Theatre, in partnership with Pohlman Reporting Company, LLC, also offers individual closed-captioning devices at performances of theatrical productions when requests are made at least two weeks in advance. Guests who are deaf or hard-of-hearing will be able to read the dialogue and the song lyrics on the captioning devices. On the date of the performance, captioning devices can be picked up at Guest Services in the main lobby. Broadway productions will usually have captioning scheduled on Saturday matinee performances of a show’s run. Any guest wishing to request an individual closed-captioning device for an upcoming performance must notify [email protected] at least two weeks prior to the performance date. Guests requesting captioning may use the handheld captioning devices from any non-accessible seat. Guests requesting captioning may also purchase a wheelchair/accessible seat (see instructions below for requesting such accessible seating) and use a provided device holder/mount to allow hands-free, line-of-sight use of the captioning devices. The holders/mounts can only be attached and used in wheelchair/accessible seats. Once a wheelchair/accessible seat is purchased, the guest should notify [email protected] to reserve a holder/mount for the captioning device. Deaf or hard-of-hearing guests requesting captioning may purchase tickets through non-telephonic means, including through MetroTix.com or by e-mail to [email protected]. 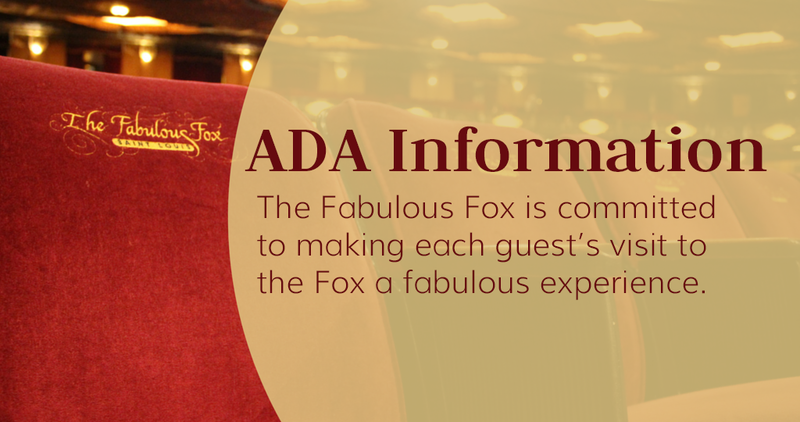 Wheelchair seating and companion seats are available for all performances at the Fabulous Fox. Accessible seating is available at the Fox Box Office, MetroTix by phone (314) 534-1111 and MetroTix.com. A number of accessible parking spaces are located near the accessible entrance to the Fabulous Fox Theatre, on the south side of Washington Street, between Grand Boulevard and Spring Avenue. Guests with special needs may also be dropped off at the accessible entrance which is located on the north side of the theatre at the blue canopy. Our front entrance and lobby are accessible. The elevator to other floors is located on the north side of the lobby. The Fox Club level is accessible by elevator, though there are several steps into each Fox Club Box and Grand Stairs Dining Room. Accessible restrooms are located on the south side of the first floor lobby near Guest Services (orchestra level) and on the third floor (mezzanine level). Trained service animals are allowed to accompany their owner into the Fox Theatre. Service animals are defined as an animal that is individually trained to do work or perform tasks for people with disabilities. The Fox does not allow other animals into the theatre including emotional support animals. Emotional support animals are not individually trained to do work or perform tasks for people with disabilities.